Ring in the New Year with all your friendly improviser pals! 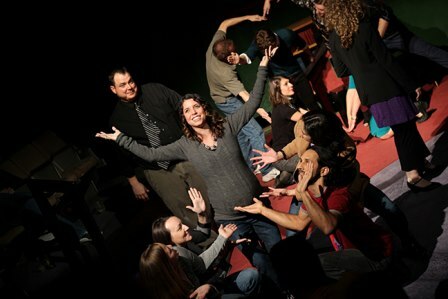 Let’s all go to the Merlin Works Improv Mixer and get ourselves a a fresh start of taking risks, making new friends and having more fun!For those of you who don’t know or need a refresher, the Merlin Works Improv Mixer is a low-pressure jam where you can meet, mingle, practice and play with talented improvisers from all over town. The Mixer is a great place for beginners to rehearse and perform and for experienced improvisers to promote their coaching skills. With our home at the AT&T Education Room at The Long Center, it’s also a great chance to share the joy of improv with the Greater Austin community. And, as always, it’s FREE! Even more, we have themed mixers to tie-in with the exciting programming at The Long Center! In conjunction with Blue Man Group (Jan. 3rd-4th) and Architects of Air (Jan. 24th-Feb. 2nd) playing at the Long Center, this month’s theme is: Movement! So get ready watch and try new and fun adventures with some really great improv games and scenes! It’s too much fun to miss! RSVP here or on our Facebook event page and come along to The Long Center on January 4th to experience the get to play with other Austin improvisers and fine tune the craft you’ve got going on. Anyone can come to play or just come to watch– so come on!